Flisvos Hotel offers basic amenities, along with amazing views of the port and town. 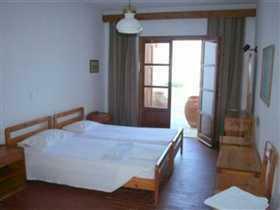 The rooms are big and simple, and all feature nice balconies to hang out on. Decorated in traditional Cycladic simplicity, the rooms of Flisvos Hotel will provide a refuge from the madness of Ios nightlife, as they are in a quiet yet central location. Flisvos Hotel in the Port of Ios, and overlooks the yachts moored in the marina. A 10 minute uphill walk or 5 minute bus ride takes you to town, with the advantage of a downhill walk home after partying. 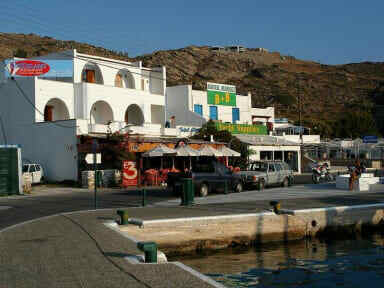 Flisvos Hotel have rooms with a view towards the sea and the moored yachts in the marina. The sunset from the rooms will make you want to spend the late afternoon on your balcony. The rooms in the back enjoy even quieter surroundings, with palm trees framing a view of the edge of Ios village. A 10 minute uphill walk or 5 minute bus ride takes you to town, with the advantage of a downhill walk home after partying. Breakfast not included (€6 per person per day). Reception Available from 09:00 until 21:00.